The work of story, in our lives and in our learning, shapes our way of being. 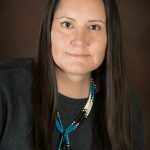 In this paper, Jana Fox shares how she most recently experienced the power of story during an exploration about how Indigenous ways of knowing and being inform her role as an Indigenous person and educator. Read to find out how she came to know Trickster as her teacher. Stories are powerful. The creation of our story, and how we share it, has the potential to transform our personal mindsets and the mindsets of those we are in contact with. What matters about our story, according to Richard Wagamese (as cited in Nicol & Yovanovich, 2017, p. 100), is that we are learning and working interdependently to create the best possible story to share, contributing to individual and communal growth, understanding, and change. When stories are fully appreciated and received with a good heart, they grow, become alive, and transform into teachers (Archibald, 2008). Recently, I have started to experience the power of story while exploring how Indigenous ways of knowing and being inform my role as an Indigenous person and educator. Engaging with story has unexpectedly led me to a deeper understanding of the Trickster as a transformative teacher. The process of coming to know Trickster as a teacher has transformed my thinking about learning, teaching and being. Coyote Trickster stories also spoke to Jo-Ann Archibald (2008) as she documented her learning journey in Indigenous Storywork, a text I used as the map for my learning journey as it details Archibald’s own engagement with Elders, storytellers, and Trickster Old Man Coyote as she explores personal and educational meaning in story. Popular characters in Aboriginal folklore, Tricksters are curious, have magical and medicinal powers, pull pranks, and can shape-shift. Archibald (2008) describes Trickster as those “whose transformations often use humour, satire, self-mocking, and absurdity to carry good lessons” (p. 5). Tricksters will often model how certain human characteristics can be annoying and hurtful while at the same time exemplify dichotomous features of generosity and kindness. According to Marie Battiste (2013), Trickster “inspire us in life with their experiences, always learning and transforming with their learning, and being the inspiration for others in understanding the various bumps and bruises of life as well as the great leaps of faith and change that come from making our choices” (p. 18). As I engaged with Archibald’s (2008) journey, long forgotten memories of traditional Blackfoot stories from my own childhood emerged, but I couldn’t remember the teachings embedded in the stories. I grew up on my father’s traditional territory: a Blackfoot reserve in southern Alberta. My childhood home was loving and safe, but Blackfoot cultural teachings were infrequent. I now attribute the lack of traditional cultural exposure to colonial influence on perceptions of what constitutes valuable learning and achievement. During the 1980s, Blackfoot ways of knowing, being and speaking were not often perceived as essential for my personal well-being or success. My grandmother recently shared with me her reasoning for emphasizing the importance of the English language rather than the Blackfoot language to her children and grandchildren; giving her children English as a first language spared them the shame and hardship she endured while learning English in residential school. Canadian colonization and assimilation policies have weighed on Indigenous peoples, including my family, for several generations. For this reason, I seldom heard the oral traditions and history of my ancestors and what I did hear are now vague memories. Archibald’s (2008) relationship to story inspired me to reconnect to my ancestor’s stories. In searching for a story to speak to me, I flipped through some Blackfoot texts and resources, trying to trigger memories of the stories I had heard many years ago. Napi and the Kaanaisskiinaiksi found me in the transcripts of two storytellers, Dr. Reg Crowshoe (2008) and Percy Bullchild (2005). The stories have some differing details, but the central plots are the same. I connected to both versions of the story and I wanted to use them as a combined learning piece. Not wanting to violate any protocols of story ownership and retelling, I contacted a friend who is knowledgeable in Blackfoot culture and teachings. She assured me that Napi stories are owned by all Blackfoot people and that I have an inherent right to use and share them as long as I acknowledge how they were accessed (R. Big Head, personal communication, January 4, 2011). To this day, I can’t remember the context of when the story, Napi and the Kaanaisskiinaiksi, was first shared with me. I had heard the story of Napi and the Kaanaisskiinaiksi in several spaces and from multiple speakers in my childhood. Each version of the story was different because each storyteller was different. My memory muddles: Who was the storyteller? Why was the story being shared? storytelling about Napi, the Blackfoot Trickster, and the Mice. In one memory, I am in secondary school (or maybe a culture camp) an awkward teenager sitting in a tipi on a spring or summer day, worrying about the new pimple emerging between my eyes, rather than listening deeply to the story being shared with me. In another instance, I am in my primary years, working my way through several facial expressions to best relieve the tension on my scalp, the direct result of the braids my mother had woven tightly, and proudly, into my hair that morning. Most likely in a state of distracted wonderment, as was my typical childhood self, I would have questioned the years it took her to master the tight, perfectly proportioned braiding technique, whether her tiny hands had contributed to braiding speed, and if the constant pull on my scalp had led to faster hair growth. I would have been sitting with my peers on a carpeted floor, wearing my older cousin’s hand-me-downs, attempting to catch pieces of a story being told by a Blackfoot storyteller, likely, a relative of mine. Why would Napi do such silly things? Is it possible to communicate with mice? Will I learn to braid hair as tightly and neatly as my mother? The stories I had heard in my youth had gone to sleep with me. I had not heard them for so long, that I had forgotten their significance and sacredness. It is now my responsibility to relearn the stories and make deep connections to their teachings. 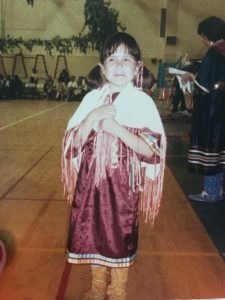 In the spirit of honouring the principles of respect, responsibility, reciprocity, and reverence, I share the story, Napi and the Kaanaisskiinaiksi, and how the teachings manifest to me in my own learning journey. Napi had been away from camp for many days. Everyone was wondering where he went and they were missing him. During this time, Napi was walking down by the river talking and visiting with the berries and trees. 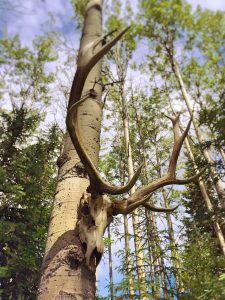 As the afternoon approached, Napi came across a large elk skull with long antlers. He sat and looked at the skull for a while when he suddenly saw a mouse run out. The mouse ran in the skull while another mouse ran out, and then another did the same. He realized there were many kaanaisskiinaiksi running in and out of the skull. Napi sat outside the skull during the meeting. He could hear the discussion. Large Mouse: Napi wants to come to our dance. Mouse #2: Well, first of all, he has to understand what we’re saying. Large Mouse: Napi can understand what we’re saying. Mouse #3: Well, Napi has to learn how the mice sing. Large Mouse: We can teach him how to sing. Mouse #4: Napi has never seen our mice dance. How will he know how to dance? Large Mouse: Oh, well, we will show him how to dance. Napi’s large eyes peered into the skull. “Can I please come to your dance tonight?” he pleaded, “I will be good and try hard to sing and dance.” The mice agreed to let Napi come to the dance. #3: Do not sleep for four days. If Napi did not follow the rules, the magic would end and Napi would cease to be a mouse. Napi thought, “No problem” and agreed to follow the rules. The mice had a ceremony and changed Napi into a mouse. Napi went into the skull to join the mice in the dancing and singing. For two days, Napi had a joyous time singing mouse songs, dancing mouse dances, and speaking the mouse language. On the third day, Napi’s eyes were drooping and his shoulders slouched. The large mouse noticed Napi’s appearance and warned him, “Don’t break the rules. You can’t fall asleep.” Napi straightened up and tried to open his eyes, but he was finding it very difficult. The mice asked Napi to sing. He was so exhausted, his lips could barely move and his song did not make sense to the mice. Suddenly, in mid-song, Napi fell to the floor in a deep sleep, snoring loudly. The large mouse sighed because he knew the magic would now end for Napi. To make matters worse for Napi, the mice ate most of his hair while he slept. A story will manifest itself in different ways to different people. There are multiple ways of understanding a story because each story contains multiple layers of metaphor and the story will unfold its meaning as the listener/reader works through these metaphors, connecting to their personal respective contexts (Wapaskwan in Archibald, 2008). Napi and Kaanaisskiinaiksi reveals to me the challenging nature and responsibilities of transforming learning and mindsets in schools to improve the well-being of Indigenous students and communities. Responsibility to engage from an appreciative mindset. The need to realistically know ourselves and our own stories in order to know our purpose and potential. Strong relationships are built on trust and commitment. Working for transformation takes a good heart and an explicit focus on commitment and integrity. Strive for balance amidst all the change. Napi wants to participate in an event that requires a responsibility to learn how to speak, interact and perform an action with a new group. Napi’s cultural learning demonstrates the importance of acknowledging and working with learners’ and colleagues’ strengths. Respecting, knowing, and building upon the diverse skills and talents of our learners and colleagues by engaging in respectful dialogue, collaborative learning, and action will promote growth and movement. Napi also demonstrates a need to know our identity, our story, to effectively approach and overcome obstacles. As leaders, learners and teachers, we must come to know our skills, gifts and talents and effectively develop them to achieve our objectives. Marie Battiste (2013) highlights Gregory Cajete’s notion of finding one’s “heart, face, and foundation” (p. 18) to nourish the learning spirit. Developing our identity, our face, requires us to use our heart to develop our skills and talents as a foundational piece for engaging in our moral and life purposes. Yet, Napi also teaches us that an honest reflection of our current mindsets and skill level informs the learning and practice we need to help us accomplish our goals. In the story, Napi does not fully appreciate the tasks the mice request of him. Perhaps if he had genuinely assessed his skills and talents, developed a plan to increase his fitness and stamina, he would have had more success in engaging and developing a relationship with the mice. Napi teaches us about the significance of trust and commitment in the development and maintenance of relationships. In the story, Napi hastily commits to the mice’s rules because he is excited to join the party. He does not recognize the hard work and honest reflection required to accomplish the goal. I can relate to the exhilaration of joining a team with the initiative of making positive changes in the education system. I think it’s a natural reaction for many passionate teachers. However, in the excitement of change, I’m guilty of committing to team initiatives without properly assessing the time, energy, and personal reflection required to be a meaningful, dedicated member of the group. In some cases, I wasn’t in the mindset to be a contributing member; I sometimes doubted my abilities to change my teaching practice and my perspectives of how people learn. Pride and disbelief inhibited the transformation I needed to make to become a better educator and team member. When change makers and leaders commit to action, trusting relationships can grow amongst the participants. Learning and action can be stalled in response to distrust and inaction amongst participants, and more notably, team leaders. A leader’s quick agreement to participate in a valued initiative without a proper assessment of the time, capacity, and/or financial commitments, can leave participants feeling disappointed and jaded. Trusting relationships positively contribute to achieving learning and organizational goals because all members, including themselves, believe each person will actively do their part in achieving success in a respectful way. These relationships are strengthened when commitment to action and integrity is explicitly evident. Committing to transformational learning is not an easy feat. Jo-ann Archibald and Jan Hare (2017) speak to the difficulties of change and Trickster’s role in transformation, “Transformational change is difficult, complex, and takes time” (pp. ix – x). Napi and the Mice inspires me to approach the complexity of transformation with a good heart because there have been times when personal biases, impatience, exhaustion and a fixed mindset have led me to forget the importance of moving forward in a respectful and reflective manner. Napi demonstrates a disregard to this approach when he breaks his commitment to the group and the mice obscure his vision with an elk’s skull, rendering him unable to move effectively until he eventually loses control of the situation. Like Napi, when I’ve acted with impatience, thoughtlessness, or lack of commitment, I’ve had to embark on the long and humbling journey of finding my footing again, reexamining my mindset, and, sometimes, reestablishing a relationship with those I have disrespected. Critical friends are valuable assets during this time because they help to remove my elk skull, allowing me to see clearly and get back on track. “It is good thing that the Indigenous Trickster remains a critical friend to help us engage in transformational possibilities and practices” (Archibald and Hare, 2017, pp. ix – x). There are many Napi stories, so I know he will get into trouble again. Who doesn’t? It’s natural to become unbalanced from time to time and make mistakes. Learning and transformation is not linear; there is no end-point. Archibald (2008, p. 1) introduces Eber Hampton’s idea of learning as a spiral, an iterative process, where information for learning builds with every iteration and new meaning can be found in each rotation. Thus, Tricksters teach us to strive for balance and harmony (Archibald, 2008). Recognizing when I am unbalanced, and acquiring strategies to bring me back to equilibrium are skills Trickster encourages me to continue developing. As I move forward and encounter new obstacles and challenges, I’ll be blinded and stumble from time to time for sure, but I’ll continue working to remove the elk skull, participating in transformative endeavors and multiple spirals of learning with a good heart and reflective mind. Jana Fox is the Aboriginal Curriculum and Culture District Teacher for the Bulkley Valley School District. Jana is passionate about learning and problem solving with educators, students, and community to build and foster inclusive practices that nurture the growth and well-being of all students. She is committed to contributing the work in changing mindsets, influencing movement toward quality, equitable systems. Jana is always learning and strives to become a story weaver, taking action and sharing stories that contribute to positive transformations in the Indigenous community. Archibald, J., & Hare, J. (Eds.). (2017). Learning, knowing, sharing: Celebrating successes in K-12 Aboriginal education in British Columbia. Vancouver, BC: Office of Indigenous Education/Indigenous Education Institute of Canada, University of British Columbia, and the British Columbia Principals’ & Vice-Principals’ Association. Battiste, M. (2013). Decolonizing education: Nourishing the learning spirit. Saskatoon, SK: Purich Publishing Ltd.
Bullchild, P. (2005). The sun came down: The history of the world as my Blackfeet elders told it. Lincoln, NE. University of Nebraska Press. Nicol, C., & Yovanovich, J. (2017). Sustaining Living and Learning Culturally Responsive Pedagogy. In J. Archibald & J. Hare (Eds. ), Learning, knowing, sharing: Celebrating successes in K-12 Aboriginal education in British Columbia. (pp. 83-100). Vancouver, BC: Office of Indigenous Education/Indigenous Education Institute of Canada, University of British Columbia, and the British Columbia Principals’ & Vice-Principals’ Association. Wagamese, R. (2015) in Nicol, C., & Yovanovich, J. (2017). Sustaining Living and Learning Culturally Responsive Pedagogy. In J. Archibald & J. Hare (Eds. ), Learning, knowing, sharing: Celebrating successes in K-12 Aboriginal education in British Columbia. (pp. 83-100). Vancouver, BC: Office of Indigenous Education/Indigenous Education Institute of Canada, University of British Columbia, and the British Columbia Principals’ & Vice-Principals’ Association. Absolutely wonderful reading this Jana. Your story has led me down a path of internal reflection, looking at my own stories and leadership practices, especially with examining the difference between excitement and readiness/plausibility and to ensure balance is there when deciding to take on initiatives. Thank you. Your story is one of powerful transformation. Thanks, Jana.